A school bus driver in Germany managed to save 60 children a minute before a train crashed into the stranded vehicle on Wednesday. 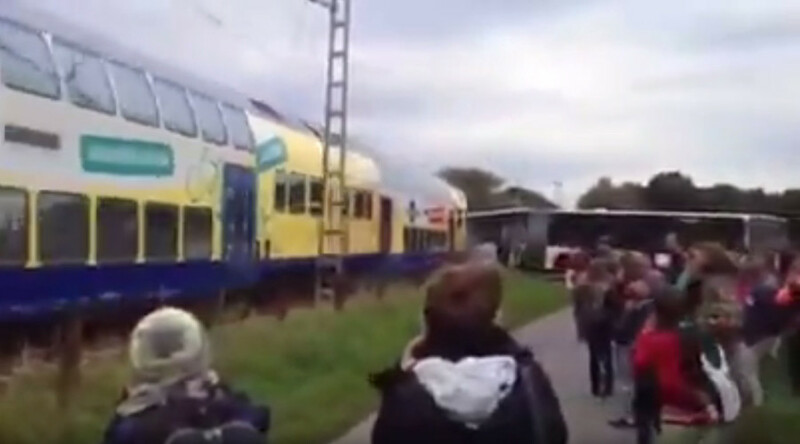 Amateur video shows a train pummeling into the bus at a rail crossing while children are still running away from the scene. The incident happened near Hamburg in northern Germany. The 23-year-old driver managed to quickly open the doors and let all the children out of the articulated bus only 60 seconds before a fast-approaching train crashed directly into the vehicle, Bild reported. The driver did not try to proceed with the crossing, the newspaper said, adding that the decision and fast actions saved at least 60 children's lives. The driver also managed to escape the bus. The usual crossing in the area was closed due to construction work, so the bus had to drive by a local bypass route, police spokesman Rainer Bohmbach told Bild. A collision alert system activated at the crossing, blocking the bus on the rails, the official added. The train driver initiated an emergency braking, but didn't manage to stop the fast moving machine. At least one person on the train was slightly injured, Bild reported, and the damage was estimated at €300,000 (US$338,000). The shocked children were taken to school on a replacement bus, while the railway line was closed. "That could have ended worse here," the police official said, praising the driver's actions.